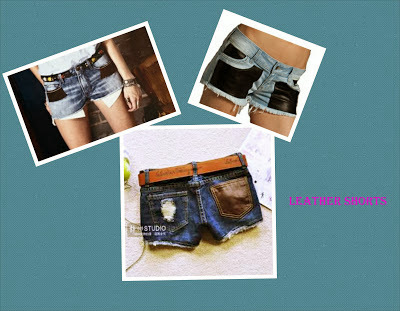 Reinvent your own Denim Shorts: Enough to create the Style.....!!!!!! The best fashion items never go out of style, and cutoff jean shorts are the perfect example. There's just something about them that says "summer," right up there with bleach blonde hair and airy sundresses. DIY summer shorts are the best when you want to combine comfort and affordability. Your denim skirts and long forgotten jeans that you had discarded years ago can grab your attention once again. Feel free to cut them to size and decorate them at will. You may never know that you are now being hailed as the next fashion diva of your locality. While you might hope to take a stroll around your locality or hit the beach dressed in these shorts, which is not all that’s there to them. They are chic and represent class now. 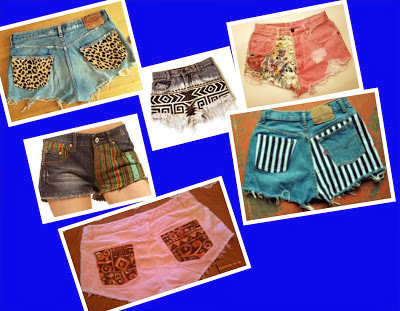 So find out the time for working on some DIY summer shorts and stay one step ahead of the current trend. 2. 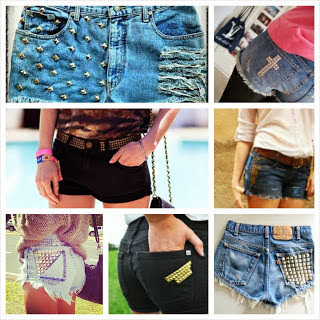 Studded Shorts : Embellished your shorts with studs......sticking studs in the front or on the pockets will definitely enhance the look ,thus adding to your personality. 3. 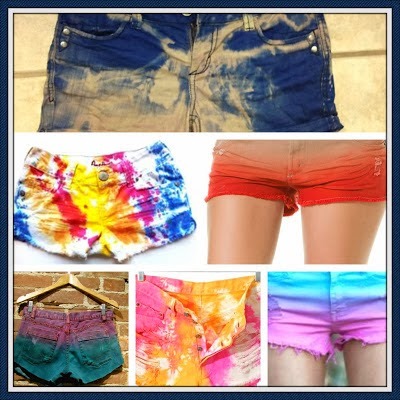 Tie and Dye shorts : Another best method to make your shorts look attractive is to use tie and dye method. Its easy and random patterns when combined with contrasting colors can give your shorts a completely different look. 4. Shorts with Leather fringes : Designing the normal shorts with Leather fringes is quite easy and it will give a different look to it as well. On the other side...attaching a piece of leather on the pockets is also in fashion these days. 6. Vintage Shorts: Not only this, you can also design denim shorts by sticking/sewing a cloth with a regular pattern on one side in the front or on the pockets.